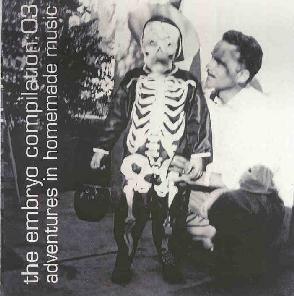 Various Artists - "The Embryo Compilation: Adventures In Homemade Music"
A collection of pop and experimental recordings, assembled by San Franciscan Brian Weaver, and consisting, it seems, of people largely associated with his band the Cubby Creatures, who appear herein. Most of the pop-oriented recordings are in pretty typical indie/alternative styles, from shoegaze to nerd folk to "math" rock to loungey hiphop to gratuitous parody. And unfortuantely, some of the songs go on for a bit too long, given the amount of creativity involved. But there are some very fine moments, beginning with the spacey, developing pop that Shackleton open the album with. "Adam's Ear", by Timonium, is a soothing organ drone spiced with subtle voicings and varied modulations. Brian Weaver's "De Quel Planet Es Tu?" builds up nicely with stummed acoustic guitar and sampled voicings over a soothing loop bed with brief violin coda and knows when it's time to quit, but his band's techno-folk "update" of the Mamas and Papas now sounds just as dated as the original, about another long-gone era of San Francisco's never dull history (whining about dot-com yuppies wore itself out around 1999). Carterette and Squinchy & the Dofros both turn in refreshingly brief tunes, the former's "Different Birds" with narcoticly sweet harmonies & subdued instrumentation over (yet another) barely-perceptible background loop, while a garage/surf instrumental by Squinchy & co. exhibits the best sense of humor on the comp. Soapbox turn in a decent stab at Can with a propulsive programmed rhythm, echoed guitar, jazzy flute, and a stutter voice quite reminiscent of Damo Suzuki. Although the compilation is far from perfect, with too many "experimental" sounds that aren't very creative, rote indiepop songs that continue past their expiration date, and jokes that are probably funny only to the people who made the album, the tracks listed above (and perhaps a few more) show that there's something interesting here happening among this diverse group of San Francisco musicians. For more information on this and other volumes of The Embryo Compilation, you can visit: http://www.cubby.net/creatures/embryo/. Contact via snail mail c/o Cubby Central; 1172 Florida Street; San Francisco, CA 94110.